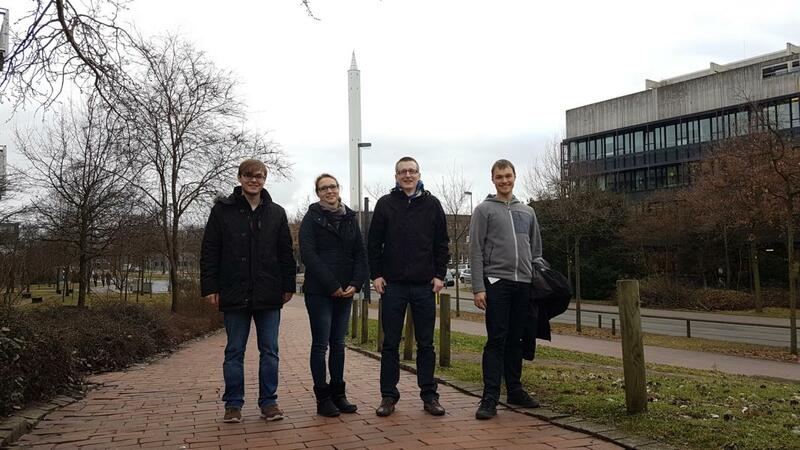 Early in the morning, on Monday, 12th December 2016, four of us were headed for Bremen to participate in the ITW (Integration Week) and to complete our EAR (Experiment Acceptance Review) at the ZARM’s drop tower. The first two days we unpacked and prepared our experiment. We performed some smaller tests, for example measuring the thrust of our system with different nozzles and testing the performance of the controller with our turntable. Tuesday evening, we visited the Christmas market of Bremen, where we met some other REXUS teams. Afterwards we had a nice walk through the city back to the hotel. The next morning we had our EAR. The experts inspected amongst other items the electrical and mechanical setup. We passed the review with great success. Thereafter we prepared the experiment for a vacuum test. First we performed an initial test at atmospheric pressure before evacuation of the 122-meter-high drop tower. Depriving the tower of all air took longer than an hour. More than enough time to have pizza before testing the thrust of our system in vacuum environment. The results were amazing! On Thursday morning our system was in for a rocky start as it was time for the vibration test. Luckily, all components continued to function even after all the shaking about. Scheduled next was a payload integration test with all other experiments of REXUS 22. Every experiment was switched on and off a few times to identify problems between the setups. On the last day we were allowed to perform another vacuum test. This time with a focus on controller performance. Instead of having pizza during evacuation time we visited the top of the tower and the catapult and learned more about the facilities. The test was successful with the spin rate of the test dummy reducing as planned. Afterwards we swiftly packed our tools and components to travel home. We had a great time at the ZARM in Bremen. Meeting all the other REXUS teams again was fantastic. A big thank you to everyone responsible for making this experience with its countless learning opportunities possible and stimulating conversations possible! Check out some more pictures in the gallery in the Integration Week section!